Are you looking for a job? Looking for a new way to network and promote yourself? Confused about choosing a major? Career Services has the tools and resources to help you succeed. From free business cards to career opportunities, its mission is to help you get connected and stay connected for a lifetime. Students can take advantage of opportunities to sharpen their job skills and earn some extra money through student-worker positions on campus. Workers are hired on a short-term, temporary basis, usually by semester, and they work no more than 20 hours a week. If you’re interested in a job opportunity or in learning more about the student-worker program, call Career Services or stop in at the Student Union office. To help with finding a job and networking, all GCU ground students are eligible to receive free business cards from Career Services. Business cards help you connect with potential employers and associates. Career Services also offers tips on networking etiquette and on how to effectively use your business cards. The staff leaders of Career Services are Jacqueline Smith and Dr. Mary Askew. Between the two of them, they have more than 35 years in career-services experience. Jacqueline Smith spent more than 20 years recruiting and hiring professionals all over the country. Before coming to GCU, she was director of career services at a for-profit college in the Midwest. She also spent time as a department chair and adjunct instructor. Dr. Mary Askew has 15 years of experience helping students unlock their potential and find their purpose. She specializes in discovering students’ interests, abilities and skills. Then she uses that information to identify potential careers and college majors. Before coming to GCU, she was a career-services consultant, working with high schools, colleges and adults worldwide. The Career Services office has the knowledge and resources to help students reach their full potential. 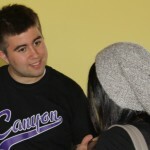 Career Services is about helping GCU students for a lifetime. Nate Perry is in his third year of college, majoring in Christian Studies. Besides working in Career Services, he is the conductor of the GCU Brass Band and is the Deputy Bandmaster at the Salvation Army Citadel Mesa Corps. He enjoys spending time with his girlfriend, Corrin, and learning more about God.